1. Measure. before you are able to make some good planning, you need to have metrics to be able to base your improvement upon. I am not talking about that stack of reports coming out of your acd or cti…You should have by now learned that it’s not the single data but the correlation between data that really affects performance. So, bring together a team of analysts and try coming out with a bunch of KPIs that assess your business, your performance and your CX in a contextualized and related fashion. 2. Be ready for change. Once you have measured your impact on those KPIs, it’s time to put some thoughts into change. 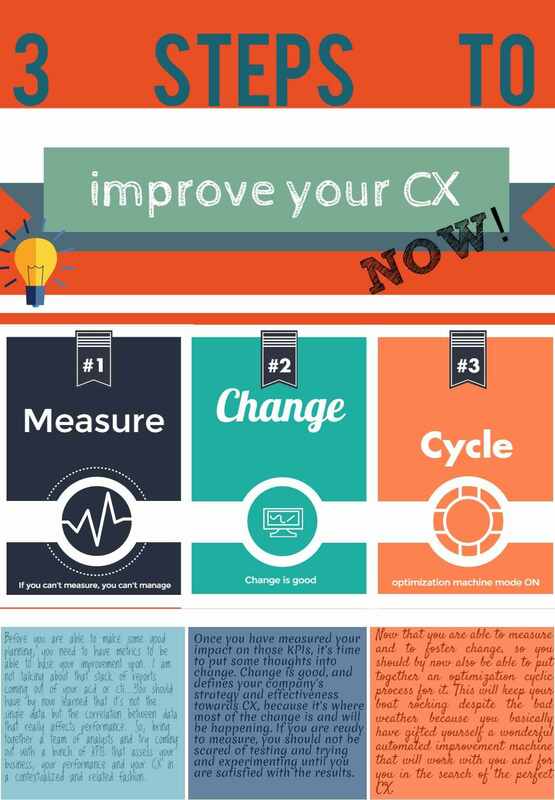 Change is good, and defines your company’s strategy and effectiveness towards CX, because it’s where most of the change is and will be happening. If you are ready to measure, you should not be scared of testing and trying and experimenting until you are satisfied with the results. 3. Put this in a cycle. Now you are able to measure and to foster change, so you should by now also be able to put together an optimization cyclic process for it. This will keep your boat rocking despite the bad weather because you basically have gifted yourself a wonderful automated improvement machine that will work with you and for you in the search of the perfect CX.